After painting all my early war armies, this project was a long anticipated challenge. I had not done very much in the way of camo patterns aside from one of my Charlemagne Division units. To make things more complex, by the time of Monte Cassino, my Fallschirmjagers had gone through a number of possible uniform colors and patterns. Adding further to that complexity was the need to match the bases to my display board. You have already seen those episodes, and how important the broken archways and rubble piles were! 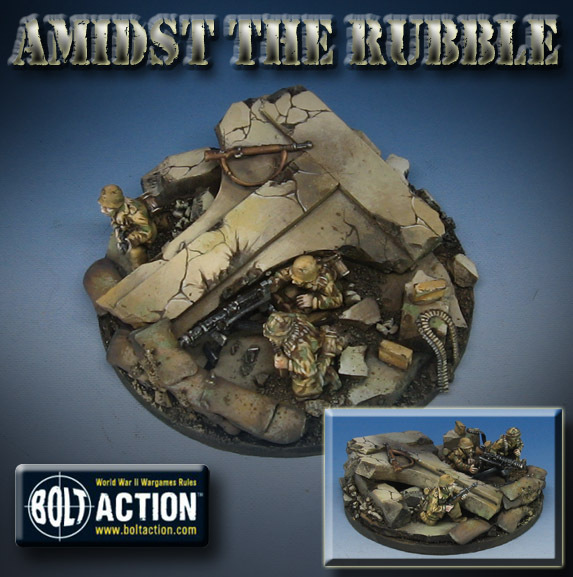 All of these pieces were measured to the board itself, so that the support weapon teams could exist in that rubble and seem as if they had turned it into strong defenses. As I continue to show images of the rest of the army, I will talk about the various uniform options, and what affected those choices. Since this was also a brand new army (with no chance to playtest it before the event! ), it would be a severe challenge just to know what represented what! While I had assembled the figures well in advance, the gear they were using was essentially alien to me, as none of it is part of the armies I have been playing for the last few years. Going from summer of '41 as "late war" to mid 1944... it was going to be a shock to the system!